The Nokia 3595 is a very close cousin to the 3590, and in almost every respect it can be thought of as a 3590 with a color screen. There are no real differences between the two phones, other than the use of color icons, and the ability to display color images in the background of the idle screen. 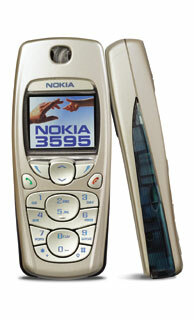 I would like to thank Treatz for lending me his Nokia 3595. Because of the striking similarities between the two phones, and the common functionality found in virtually all Nokia phones, there isn’t really anything about this phone that sets it apart other than the color display. Okay, the oddball keypad is different from the 3590, but that’s hardly a big difference. On the positive side, at least the keypad font doesn’t look like something out of a twisted fantasy (as was the case on the 3590). If you really hate that keypad (and I wouldn’t blame you) you can always replace the faceplate of the 3595 with a 3590 faceplate. However, be advised that you must also purchase the rubber bit that comprises the keys themselves, as these do not come with a stock Nokia 3590 faceplate. The color screen is a bit odd, in that it seems to be nothing more than a colorized version of the monochrome display found on the 3590 (and indeed many other non-color Nokia phones). It therefore has perhaps the lowest resolution of any color display on the market at this time, and as a result it looks rather blocky. Additionally, the pixels look a tad fuzzy. Nokia didn’t even bother to create a new menu scheme for the phone. They simple added color to the old Series 30 menu system, and left it at that. The only real extra they give you is the ability to display low-resolution color images on the background of the idle screen. Some of the games make good use of the color, and you can certainly find Java applets that make good use of it too. The overall quality of the screen isn’t terrific. The backlight has an annoying yellowish tint to it, and it simply isn’t bright enough to see in direct sunlight. The screen is difficult to see properly without the backlight, but it isn’t as bad as with some high-end phones such as the Ericsson T68i. But is all this necessarily a bad thing? Given the price of this phone, I think it’s actually a great compromise. It gives you color for virtually the price of monochrome, and for phone buyers on a budget, it’s probably a great marketing ploy. One of my huge gripes about the 3590 was the lack of volume in the polyphonic ringtones. I was skeptical that this had been fixed in the 3595, but I tried it out at a crowded noisy mall just the same. I’m happy report that I had no trouble hearing the ringer (the loudest one is call “Low”) even with the phone on a belt carrier. While it wasn’t nearly as loud as the piezo ringer on the 6310i, it was loud enough for a busy mall on Saturday afternoon. RF performance of the 3595 is excellent, and it falls short of my 6310i only by a small margin. I’d have to say that the RF performance is about half way between the recently-tested Siemens SL55 and the Nokia 6310i. Those phones weren’t much different from one another, so you get the general idea. Earpiece volume is also excellent, but contrary to what some people seem to believe it is not louder than the 6310i. To confirm this I put Fido SIMs into both the 3595 and the 6310i. I then called 611 and I listened to identical recordings running in unison. The sweet spot on both phones was identified, and the phones were rapidly swapped on the same ear. If the 3595 sounded at all louder it was probably because the overall tonal balance was a little harsh. In fact, it could sound downright shrill at times, which was in stark contrast to the smooth and balanced sound produced by the 6310i. Because some of the shrillness pierces the ear (so to speak) it creates the illusion of greater volume. Now I could have lived with the tonal balance of this phone, and perhaps even learned to like it, but there was one other aspect of the incoming audio I simply could not dismiss. This phone has a nasty dose of Sidetone. This refers to a sample of the microphone input fed to the earpiece. I’ve often said that this is a great idea on a landline phone, and a terrible idea on a cell phone. Why isn’t Sidetone a good idea on a cell phone? For starters we don’t need it, but most of all because when the phone is used in a noisy environment the background noise comes through the earpiece as a distracting noise. If you already own a 3595 and you want to know what a phone with no Sidetone might sound like, just put your finger over the microphone during a call, or mute the phone. It makes the 3595 sound 10 times better, but it isn’t a real solution, since you now can’t talk to your caller. Outgoing audio sounds good in a quiet environment, but in places such as noisy shopping malls on a Saturday afternoon the sound quality is decidedly substandard. The audio suffers from a type of distortion that I routinely hear on CDMA phones running the EVRC CODEC. Perhaps the 3595 is trying to cancel the background noise, but it certainly doesn’t do a very good job of it, and the audio gets mangled anyway. Because of the audio problems on this phone (particularly the Sidetone issue, and the poor outgoing audio quality) I couldn’t see myself using a 3595. RF performance and audio volume are certain great, but the other problems just cancel them out for me personally. However, none of the problems with this phone are huge, and I believe that less picky users will find plenty to like about the 3595. As I noted earlier, it gives you a color display for the price of a monochrome display, a loud earpiece, loud polyphonic ringers, good RF characteristics, and it has all of the usual Nokia goodness (including Java applets). P.S. Treatz also lent me a leather carrying case for the 3595 to see if I could prove a rumor concerning such cases and RF performance. I could not detect any difference in performance with or without the leather case on. I rather doubted that it would have any impact, and while I can only say for certain that the specific case I was loaned had no effect, I fail to see how leather alone would affect performance. If the case had metal inserts, that might have been a different matter.